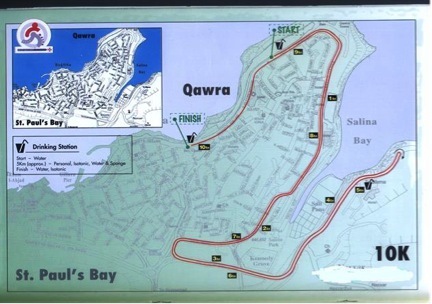 The race will start by the Harmony Kiosk , Triq it-Trunciera, Qawra (200m down from the Oracle Casino in the direction of Qawra Point) and will end at Bay Square, Bugibba. Athletes are to run with the number assigned to them in the previous 2013-2014 Road Running League events. A. Only new entries [i.e. Senior/ Junior athletes not previously entered for the 2013 / 2014 Road Running Events] should be entered. by not later than Friday 3rd January 2014. Participating clubs are reminded that they are obliged to provide at least one helper to the Malta Amateur Athletic Association. Clubs are being requested to inform the MAAA in advance regarding the name of the official / s they will be providing. Helpers will mainly be used as course marshals and have to assemble at the start by no later than 7:30 a.m.
After the start, the runners will head towards the Fra Ben Restaurant and then turn right in the direction of the Suncrest Hotel. Runners will head towards the Football Pitch at Bugibba and then will turn sharp left at the Traffic Lights Junction. Athletes will run on the left hand side of the road towards Salina and at a point indicated by a judge [which is about 200m past the Salina Hotel] they will turn back along the same route. Runners will now run along the other side of the road and will only switch to the other side at an indicated point after Kennedy Grove. After Kennedy Grove runners will head towards traffic lights and after going past the football ground will head towards Fra Ben and then run along the Qawra sea-front. The finish is at Bay Square, Bugibba. Calendar 2014 now available from menu selection.